Disney’s fall movie schedule is typically headlined by both the Star Wars and Marvel movie franchises, but with the Avengers figuring things out until next May and Star Wars in production now for next December, Disney is looking to their other magical properties to pick up the slack. One of those is the first ever big budget rendition of The Nutcracker, titled The Nutcracker and the Four Realms. While it looks like a sideway match of the Alice in Wonderland series, the trailers have actually been somewhat promising. But who are the characters we’ll be meeting along with colorful new journey? Meet them in a set of new character posters below. Directed by a duo of Joe Johnston (Captain America: The First Avenger) and Lasse Hallstorm (Chocolat), the story follows young Clara (Mackenzie Foy) as she discovers a parallel world that’s home to four realms: Land of Snowflakes, Land of Flowers, Land of Sweets and the fourth realm that’s home to the tyrant Mother Ginger. All Clara wants is a ket that will unlock a priceless gift from her late mother, and along the journey to find the key, she meets a cast of new characters that will help her retrieve the key and hopefully bring harmony to the unstable world that her mother created. It sounds like your classic Disney tale with magic, colors and one-of-a-kind characters from the farthest depths of creativity. I don’t expect to see this movie blue me away, but I’m quite interested in seeing what kind of spin Johnston and Hallstrom can put on the classic stage play. We haven’t seen a whole lot of nutcracking going on, so is it just a title to get butts in the seat or does “the Nutcracker” play a pivotal role in the overall story? Hopefully we get the former with some oomph. Check out the brand new characters posters below, and make sure to leave your thoughts about the trailers and the movie overall in the comments! How have you faired with the footage? It it just too much of the same? Am I missing anything that will get me excited? 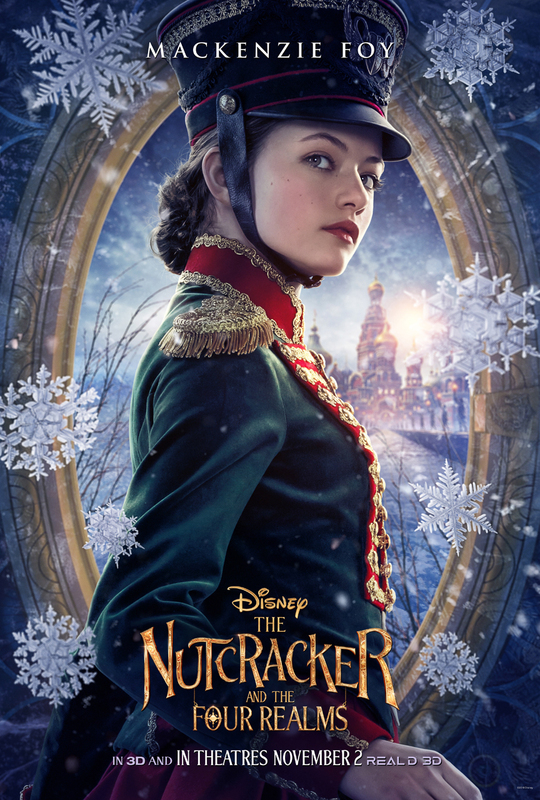 Also starring Keira Knightley, Jayden Foworo-Knight, Jack Whitehall, Misty Copeland, Richard E. Grant, Eugenio Derbez, Helen Miren and Morgan Freeman, The Nutcracker and the Four Realms opens everywhere on November 2nd. First ‘Captain Marvel’ Trailer Reportedly Being Released Tuesday Morning!